A mild start and a cool finish turned Washington's weather upside-down last month. February is a month that typically sees steadily warming temperatures thanks to an increasingly powerful sun. This year, however, February was turned on its head. Many southern and eastern areas actually observed very little trend in temperature during February, as colder air masses during the latter half of the month served to balance the solar warming. Overall, the second month of 2013 was generally uneventful and dry, especially early in the month. After mid month, the weather became slightly more active. A strong storm on February 22nd brought strong winds, heavy west-side rain, and heavy mountain snow to the state. 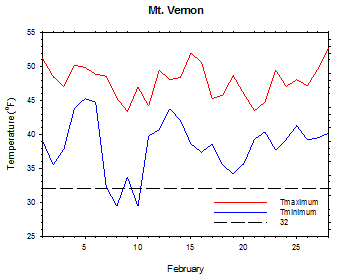 In fact, the mountains received much more snow in the second half of February than in the first half. Thanks to sunshine and the passage of weak weather systems, temperatures were somewhat above average in central Washington, although there was a lack of extreme temperatures. Daytime temperatures were well above average, while overnight lows were generally slightly below average. Although Mt. Vernon's temperature was also somewhat above average, the pattern was reversed in western Washington, with above normal low temperatures and slightly below normal highs. In keeping with February, the 2012/2013 winter was generally a season of contradiction. Despite very mild average temperatures in December in central Washington, stormy conditions led to significant mountain snowfall. In January, the reverse situation developed, as a stable ridge of high pressure caused cold and stagnant conditions in the lowlands, but mild and dry conditions in the mountains. February ended up somewhere in between the two extremes, with generally benign weather early on giving way to more active conditions late in the month. The winter as a whole was warmer than normal, with mild temperatures during 2 of the 3 months. There was also a notable lack of arctic air this winter. The coldest temperature at Prosser (WSU IAREC) was 16 degrees. 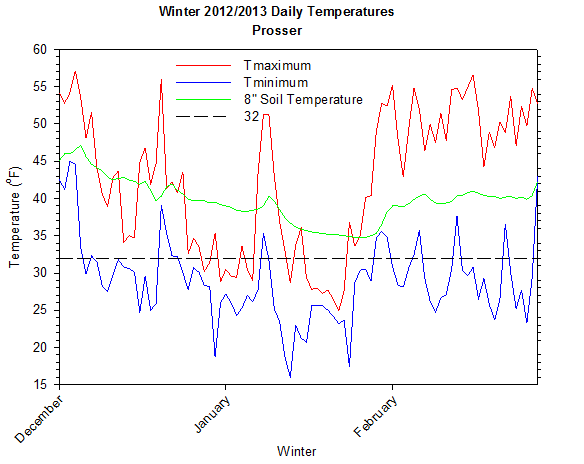 There have been only two other winters since 1992 when the temperature failed to drop below 16 degrees at Prosser. In December, highlights of the month included a mountain blizzard on December 17th and a White Christmas for many locations. 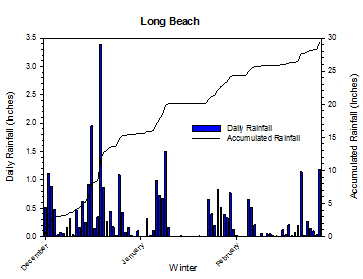 Due to its stormy nature, Long Beach had only one dry day during December. In January, cold and stagnant conditions on the afternoon of the 15th led to an unusual temperature pattern, as the mountains were around 30 degrees warmer than the lowlands. 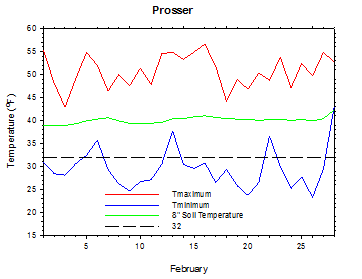 In the course of one month, Prosser transitioned from the warmest December since late 1990s to the coldest January since 2008, before mild conditions returned to close out the winter. February began with mild conditions, as high pressure built into the region on Groundhog Day. A series of weak systems traversed Washington on February 3rd, and then a stronger system arrived on February 5th and 6th. Despite some snowfall in the mountains, temperatures in south central Washington warmed into the 50s. Drier conditions arrived as high pressure built into the state on February 8th, and the mountains experienced warming conditions. Weak systems brought periodic rain to western Washington from February 12th to 14th, although much of the region remained dry. 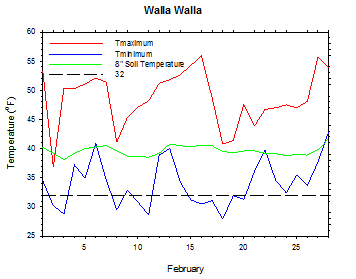 Sunny and windy conditions caused warm temperatures in south central Washington, as parts of the Yakima Valley approached 60 degrees on February 13th. Another storm system arrived on February 16th, and signaled a pattern change, as a deep trough moved over Washington. Temperatures became notably cooler by February 18th, although most of the storm energy remained south of the state. 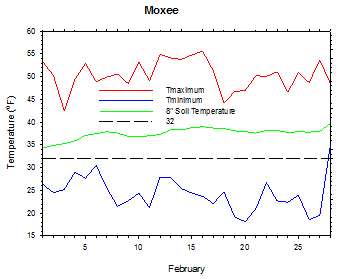 On the morning of February 20th, the temperature at Moxee fell to 18 degrees. Wet weather on February 21st was followed by the strongest storm in several months on February 22nd. Heavy rain, strong winds, and up to 2 feet of mountain snow buffeted the region. Another storm on the night of February 24th brought more rain and mountain snow to the state. An unsettled pattern continued through the end of the month, although milder weather arrived on February 28th. 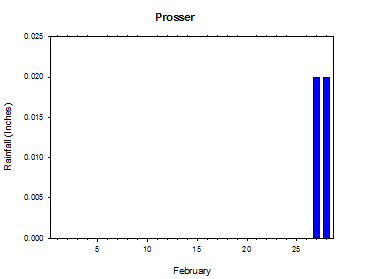 The average February temperature at Prosser (WSU IAREC) was 39.2°F, which is 1.2 degrees above average. The average high temperature was 50.7°F, which is 4.0 degrees (1 standard deviation) above average. The average low temperature was 29.5°F, which is 0.6 degrees below average. The maximum temperature recorded last month was 56.6°F on February 16th, while the coolest daily high was 42.9°F on February 3rd. Low temperatures ranged from 43.0°F on February 28th to 23.3°F on February 26th. Daily average temperatures ranged from 46.1°F on the 28th to 34.1°F on the 3rd. The monthly precipitation total was 0.04 inches. The average wind speed was 4.4 mph, and the average 8 inch soil temperature was 40.1°F. 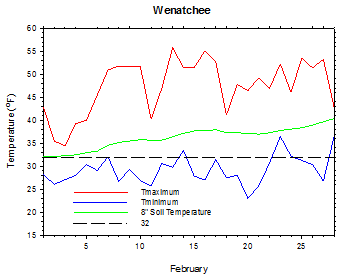 Wenatchee (WSU TFREC) recorded an average temperature of 37.3°F, which is 2.5 degrees above average. 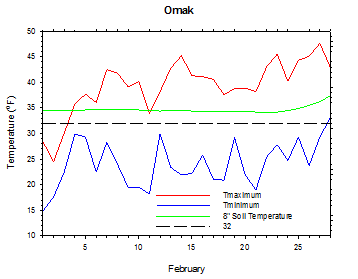 February 1st: The temperature at Omak fell to 15 degrees. 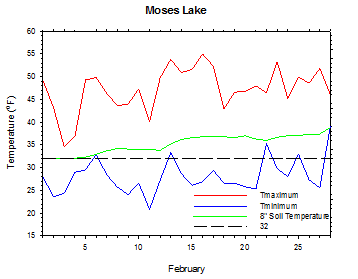 February 20th: The temperature at Moxee fell to 18 degrees. February 22nd: 1.14 inches of rain fell at Long Beach. December was generally an active, wet, and windy month. Temperatures in central Washington were around 4.5 degrees above average, and the warmest since the late 1990s. 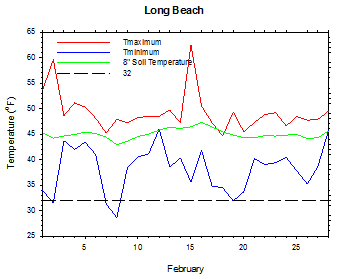 Long Beach experienced only one dry day (December 30th) during the month, and received nearly 3 and a half inches on the 19th. Cooler weather at the close of December allowed many locations to enjoy a White Christmas, while periodic snowfall allowed the mountain snowpack to reach above normal levels by year's end. One notable storm arrived late on December 16th and lasted into the 17th, and brought heavy rain to western Washington, along with strong winds and blizzard conditions to the mountains. Wenatchee Heights recorded a wind gust of 63 mph during the storm. January was a very different month, with generally cold and dry conditions in the lowlands. A ridge of high pressure dominated the weather during the middle of the month, as calm and stable conditions allowed a strong inversion and poor air quality to become established. On the afternoon of the 15th, temperatures were in the 50s at Mt. Rainier, but only in the 20s in central Washington. Low clouds and limited mixing led to the coldest average high at Prosser since 2004, although there was a general lack of temperature extremes during the month. By contrast, the mountains were generally mild in January. The only active periods occurred from January 6 to 10, and at month's end. During these times, storms brought rain to western Washington, snow to the mountains, and stronger winds to the state. As a result, the lowlands were relatively warm during these periods. 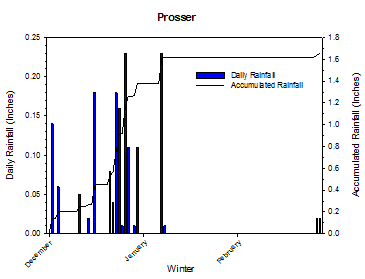 The average winter temperature at Prosser (WSU IAREC) was 35.4°F, which is 1.0 degrees above average. The average high temperature was 42.6°F, which is 1.3 degrees above average, while the average low temperature was 29.0°F, which is 0.9 degrees above average. Daily high temperatures ranged from 57.1°F on December 4th to 24.9°F on January 22nd. Low temperatures varied from 45.0°F on December 3rd to 16.0 °F on January 13th. Daily average temperatures ranged from 51.9°F on December 4th to 23.0°F on January 13th. 1.66 inches of precipitation fell during the winter season. 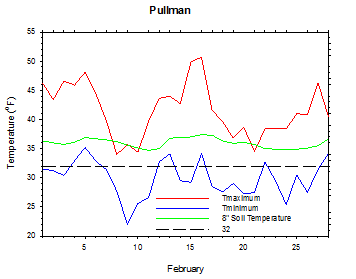 The average wind speed was 3.9 mph, while the average 8 inch soil temperature was 39.7°F. Other locations also experienced above normal winter temperatures. 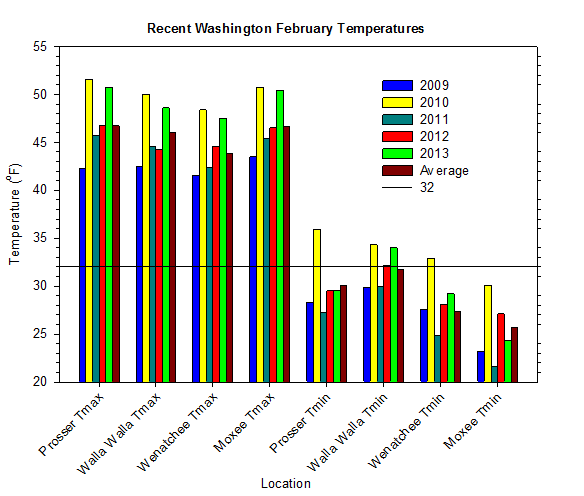 Wenatchee (WSU TFREC) had an average seasonal temperature of 33.1°F, which is 1.7 degrees above average. 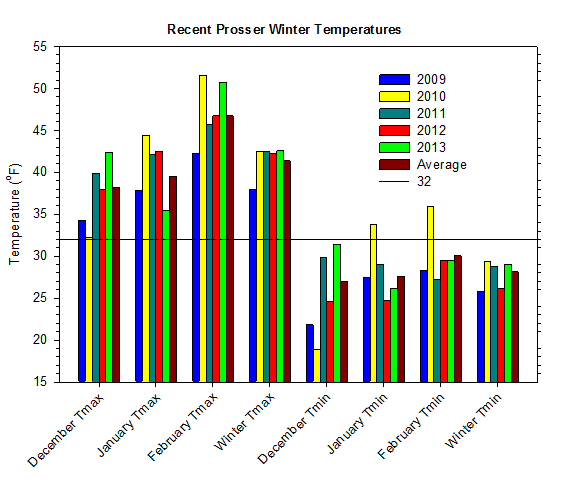 Overall, the winter of 2012/2013 was 1.5 degrees warmer than the last winter at Prosser (WSU IAREC), although the overnight temperatures were significantly (2.8 degrees) warmer. January 7th: The wind gusted to over 60 mph at Wenatchee Heights. December: Mild and active, especially early in the month. January: Dry and cold in the lowlands. February: Mild and dry, especially early in the month. Generally benign agricultural weather continued during February, with no adverse effects reported. Preparation for the growing season, including pruning and field clearing, was well underway in many areas last month. Precipitation was below normal, with some parts of central Washington receiving no rain or snow during February (National Agricultural Statistics Service). 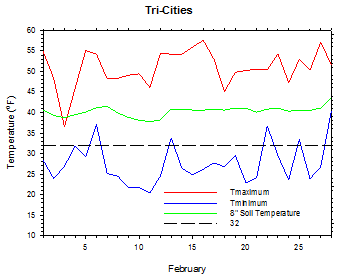 On February 20th, 1995, the temperature at Prosser (WSU IAREC) rose to 70 degrees. According to the Climate Prediction Center, below normal temperatures and near normal precipitation is expected during the spring, and then above normal temperatures and below normal rainfall is forecast for the summer and early autumn.